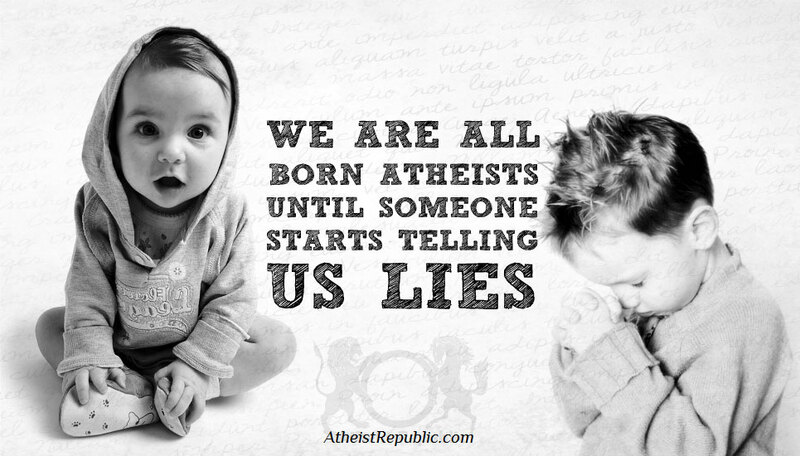 We are all born atheists until someone starts telling us lies. I don't really buy that. I don't really buy that. There are too many cultural and traditional influences for a practical application of this. 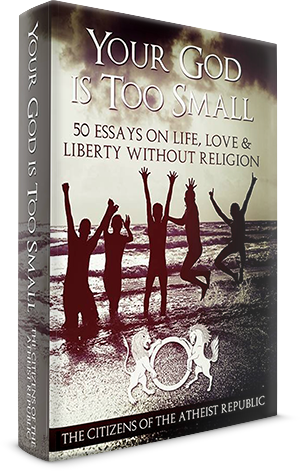 A common remark of the atheist to the theist is something to the effect of 'If you were born in another place or another time you would be worshiping another god!' Seems myopic to me, because so would they. I think the shoe is on the other foot, in fact. I believe we are all born believers until someone starts telling us lies. Being brainwashed to believe certain things from when we are children, is in my view, being taught to completely ignore reality and common sense. This, in turn, opens the door for people to believe other ridiculous things, which will create chaos, and hurt in their lives. For instance, creeps that claim they can communicate with the dead. These people have been proven frauds going back 150 years. ( look it up... there is a trick to EVERYTHING) The only "gift" they have is taking people's money, and preying on the emotions, and vulnerabilities of weak minded people at their most desperate time. Religious people will also believe in psychics, money scams, internet dating hoaxes where they will send a complete stranger all of their money, because they want to" believe" that the person on the other end of the computer reallty " loves" them. They will believe that if they look up into the clouds, that they are seeing either Christ, or a deceased loved one... you can see whatever it is you WANT to see, but it dosen;t mean it is really there. But these people believe that it is. The bottom line is, once someone makes their mind up to believe something, NOTHING is going to change their mind, no matter what proof you can show them, or how illogical it is. Believing in religion also breeds weak minded people that leads to every kind of " addiction" under the sun. Another thing I never understood, is the idea of celebrating Christmas. There is not one biblical writing that tells us to celebrate the birth of Christ, or can pinpoint an exact date, or time of year that this was supposed to have happened. Dosen't anyone wonder how scientists can collect evidence, and information using high powered, sophisticated equipment, enabling them to identify things that have taken place during a specific time period, going back millions, and billions of years ( dinosoars, planets, atmospheric explosions, species linked to humans, etc) and these things are REAL, and PROVEN REAL. Science does not lie. Yet, with the birth of Christ, which is only a fraction of the time periods listed above, it is acomplete mystery..no one seems to know. 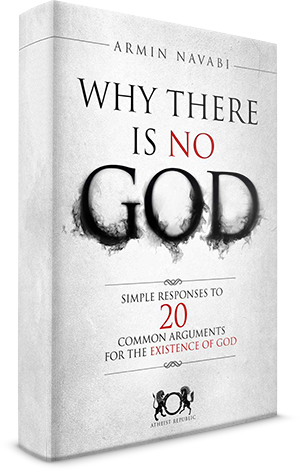 Thats because there is no evidence of any of this, and thatswhtyICALLcelebrating of Christmas the "Big Hoax." Easter is another "hoax." If this great event is supposed to have happened, why is there no exact date? Why does the date change every year... sometimes differing by several weeks year to year. Shouldn't it have occurred on a specific date, like christmas was supposed to have happened? It's all balony.